Find the event info, schedule, tips, solutions, guide for your better achievement! The Rosy Road to Glory consists of two parts: Honor Emblem and Ultimate Explore. a. 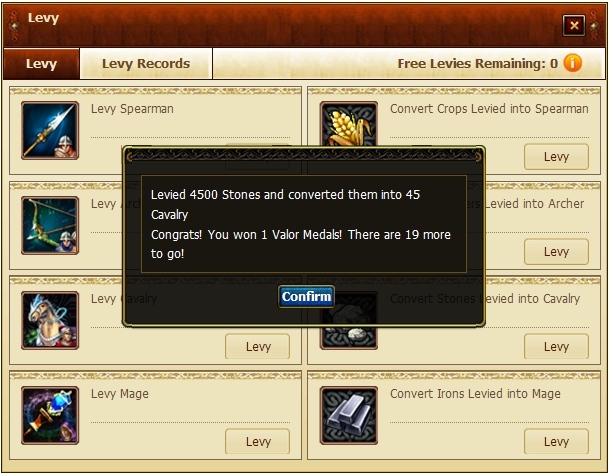 You will be able to get Valor Medal in Arena PvP fighting(max 15 per day) and robbing in World(max 10 per day). b.Get 1 Valor Medal for every 50 Diamonds. The more Diamonds you purchase at a time, the more Valor Medals you can get. No limitation! 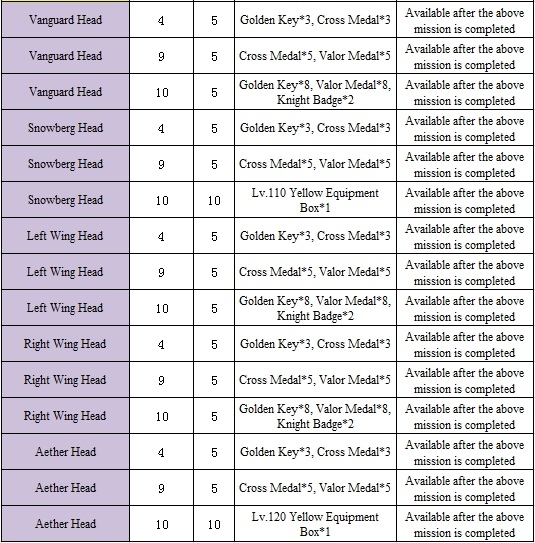 For example, if you purchase 100 Diamonds at a time, you will get 2 Valor Medals. But if you purchase 99 Diamonds at a time, you will only get 1 Valor Medal. c. If you challenge other players in Arena and win, or successfully rob wildland, you will have a chance to get the Knight Badge. You can also buy Knight Badges in the Shop, each of which is worth 5 Diamonds. The Knight Badge will be removed from the Shop when this event ends. 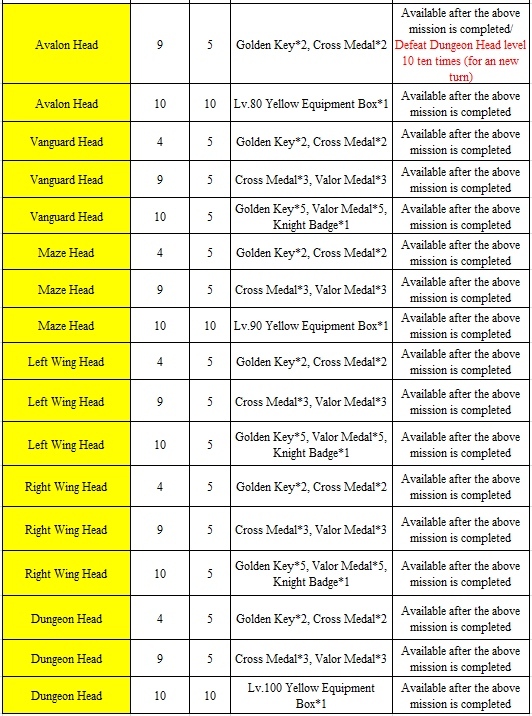 d. Exchange for the following rewards in the Reward – Honor Emblem panel. Stamina Book *2; Strength Book *2; Agility Book *2; Intellect Book *2. Open it to get 1 or 4 sets of the rewards in the Book Giftpack randomly. Reserve Barracks *2; Holy Light *4; Sly Goblin *5; Reinforced Case *4; Advanced ATK Charm *4; Advanced HP Charm *2; Advanced DEF Charm *4. Open it to get 1 or 4 sets of the rewards in the Valor Giftpack randomly. Sly Goblin *5; Reinforced Case *4; Stamina Book *2; Strength Book *2; Agility Book *2; Intellect Book *2; Advanced ATK Charm *4; Advanced HP Charm *2; Advanced DEF Charm *4; Duty Set (Damage or Armor) one piece; Assassin Set (Damage or Armor) one piece. Open it to get 1 set of the rewards in it randomly. Sly Goblin *5; Reinforced Case *4; Stamina Book *2; Strength Book *2; Agility Book *2; Intellect Book *2; Advanced ATK Charm *4; Advanced HP Charm *2; Advanced DEF Charm *4; Ironfeather Set (Damage or Armor) one piece; Meteorite Set (Damage or Armor) one piece. Open it to get 1 set of the rewards in it randomly. Sly Goblin *5; Reinforced Case *4; Stamina Book *2; Strength Book *2; Agility Book *2; Intellect Book *2; Advanced ATK Charm *4; Advanced HP Charm *2; Advanced DEF Charm *4; Brightor Set (Damage or Armor) one piece; Darkor Set (Damage or Armor) one piece. Open it to get 1 set of the rewards in it randomly. Sly Goblin *5; Reinforced Case *4; Stamina Book *2; Strength Book *2; Agility Book *2; Intellect Book *2; Advanced ATK Charm *4; Advanced HP Charm *2; Advanced DEF Charm *4; Templar Set (Damage or Armor) one piece; Bloodlust Set (Damage or Armor) one piece. Open it to get 1 set of the rewards in it randomly. 1. The Bright gets bright equipment while the Dark gets Dark equipment. 2. 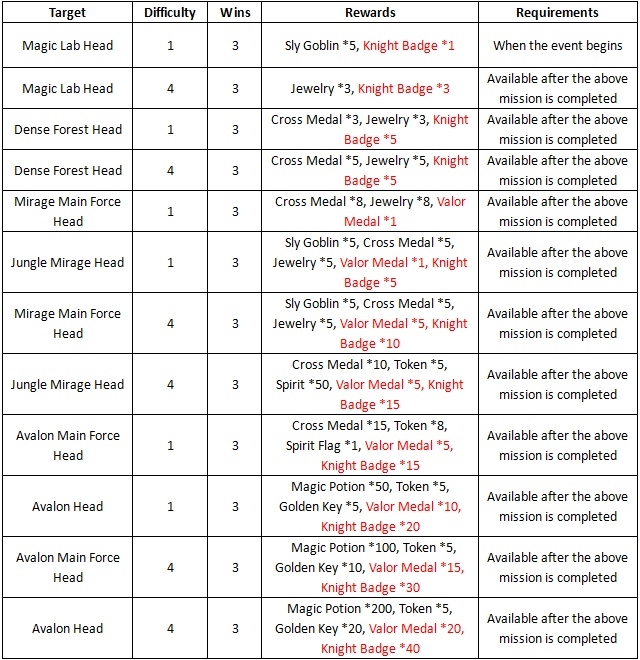 The unused Valor Medals and Knight Badges will be removed by the system when this event ends. 3. The unused Tokens, Giftpacks or Treasure chests can be kept when this events ends. During this part of the event, as long as you fight in Explore and meet the requirements listed on the form below, you will be eligible to claim rewards in the Reward – Ultimate Explore panel! You can claim the rewards for each mission only ONCE. 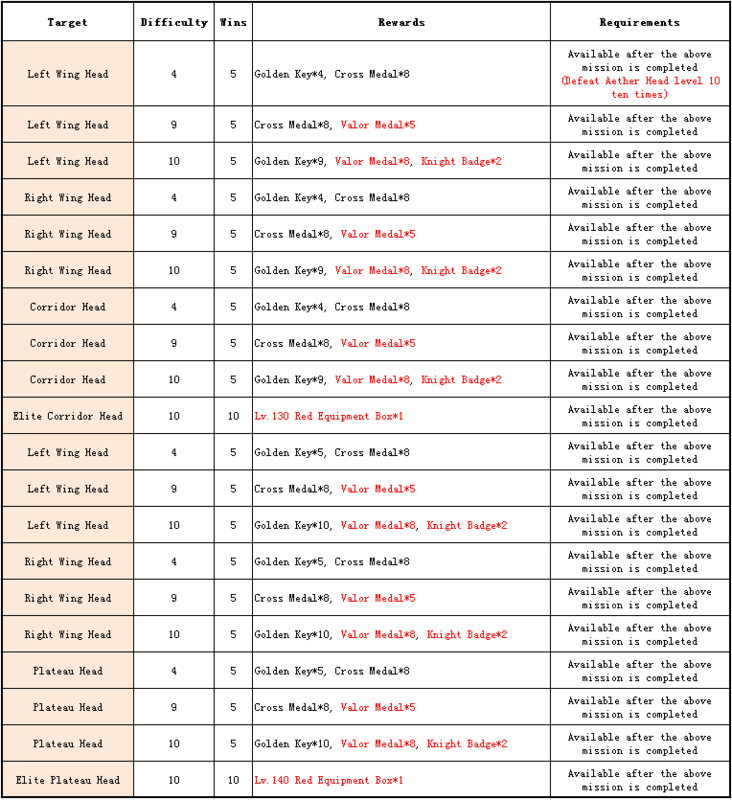 Note: The following part is a whole run and can start again. I. How to exchange medals and badges for rewards? Get Valor Medals through Levies on seized cities; get Knight Badges through challenging other players in Arena or robbing the wildland. Exchange for rewards in the Reward – Honor Emblem panel. 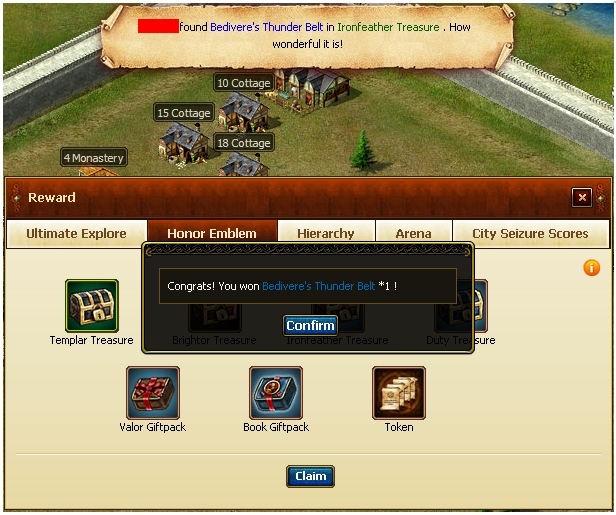 Click on the Treasure Box on the top right area of the screen to enter the Reward panel and then click Honor Emblem. When you meet the requirements to claim a chest, a giftpack or a Token, its name will show in black; while those unattainable for the moment, red. Choose the chest you want and then press Claim. You may get the superior equipment you dream of! II. How to get rewards for the Ultimate Explore? Know where to claim the rewards. Click on the Treasure Box on the top right area of the screen to enter the Reward panel and then click Ultimate Explore. Fulfill the Requirements and then the rewards are yours! I actually have no idea how to play this game. Thanks so much for the explanation!If you're planning to compose an essay, here is the helpful source for you to consider: http://livecustomwriting.com/blog/valor-and-honor-in-alexander-the-great-essays, just click ahead to find out what it is exactly.